Controlling the movement of air between the conditioned interior environment of a building and the exterior is a core function of building science. However, if you ask someone the best method of doing this, you are likely to get dozens of different answers. The best route depends on several factors—from building schedules and regional climate to building codes and industry best practices. There are also many product and installation factors to consider. One potential option for air barrier assemblies involves using building wraps and other weather-resistant components to guard against airflow without preventing moisture escape. Quite simply, an air barrier is a material or system of materials designed to control airflow between conditioned and unconditioned spaces. It serves as the primary air enclosure boundary separating indoor and outdoor air. Within multifamily construction, the air barrier system also separates the conditioned air from any given unit and adjacent units. Air barriers also typically define the building enclosure’s pressure boundary. The requirement for continuous air barriers was added to the International Energy Conservation Code (IECC) in 2012, and there are a number of ways to meet this requirement. As part of this mandate, the code requires all new construction and additions to be visually inspected, as well as pressure-tested, as standard operating procedure. To know whether a given material can serve as an effective air barrier, it is first important to understand an air barrier can be defined as either a material or an assembly—each category is subject to a specific set of tests. For an individual building material to be classified as an air barrier, its air permeance (i.e. amount of air migrating through materials rather than holes or gaps) must be equal to or less than 0.02 L/(s-m2) @ 75 Pa (0.0004 cfm/sf @ 1.57 psf) when tested in accordance with ASTM E2178, Standard Test Method for Air Permeance of Building Materials. 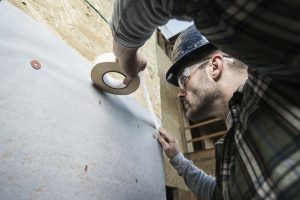 Gypsum board, liquid-applied membranes, sprayed polyurethane foam (SPF) insulation, and this article’s focus—polyethylene (PE) or polypropylene building wraps—are all examples of air barrier materials. 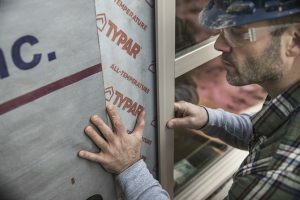 Among these various types of air barrier materials, the TYPAR brand of building wraps have become the performance benchmark as it relates to air and moisture holdout. 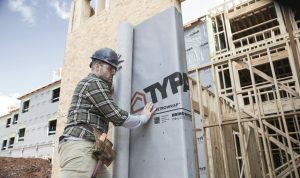 With the ability to function as a Type I air barrier, TYPAR building wrap material eliminates drafts in the wall, which helps reduce energy costs over time while providing a more comfortable indoor environment for building occupants. The requirements for an air-barrier assembly are somewhat less stringent, and are measured in terms of air leakage. When tested in accordance with ASTM E2357, Standard Test Method for Determining Air Leakage of Air Barrier Assemblies, the subject must be 0.20 L/(s-m2) @ 75 Pa (0.04 cfm/sf @ 1.57 psf) in both directions (i.e. infiltration and exfiltration), which works out to 10 times greater than a material alone. This method is intended to simulate the performance of various air barrier materials and accessories when combined into an assembly. This ‘air barrier assembly’ is defined as a group of materials assembled and joined together to provide a barrier to air leakage through the building envelope. For example, use of a weather-resistive barrier (WRB), combined with properly installed flashing and tapes, would be considered an air barrier assembly. Air barriers can also be defined through whole-building testing in accordance with ASTM E779, Standard Test Method for Determining Air Leakage Rate by Fan Pressurization. This test method is intended for the measurement of the airtightness of building envelopes of single-zone buildings. For the purpose of this test method, many multi-zone buildings can be treated as single-zone by opening interior doors or inducing equal pressures in adjacent zones. As stated previously, numerous materials can achieve the ASTM air leakage requirement, but this does not necessarily mean they will perform in the field once installed as part of a system. The question becomes whether the material will be able to hold up to the rigors of the jobsite and installation. After all, an air barrier’s performance is defined by its weakest link, and it only takes one tear or unsealed connection to compromise the entire system’s integrity. Standing up to the elements is a tall task. As the primary boundary between indoor and outdoor air, the assembly will be subjected to constant air movement, water, ultraviolet (UV) light, and surfactant chemicals present in certain cladding materials and cleaning agents. Any one of these elements could potentially cause materials to break down over time, jeopardizing their effectiveness as air barriers. Likewise, if a material is not sufficiently durable to stand up to installation conditions, it cannot perform its function. Commercial construction amplifies the importance of these concerns. Exceptional durability is needed to handle the stronger wind loads faced by taller buildings. Tear strength, as measured by the grab trapezoidal tear test as part of ASTM D5034, Standard Test Method for Breaking Strength and Elongation of Textile Fabrics (Grab Test), is a good measure for predicting an air barrier’s ability to stay on the wall after installation. In this test, a 1.2 x 1.8-m (4 x 6-ft) sample is tested for tensile strength by moving a pair of clamps apart at the specified rate until the specimen breaks or ruptures. Further, the longer construction timelines typical of many commercial building projects put added emphasis on an air barrier’s ability to withstand extended exposure to UV light, as weeks or even months may pass before exterior cladding is installed over the building wrap. It is critical to double-check how much exposure time the manufacturer’s warranty covers. For example, WRBs like TYPAR® MetroWrap are made specifically for commercial applications. The polypropylene building wrap has a tear strength five times greater than most wraps on the market and has a UV exposure rating of 12 months. It is also important to consider the type of exterior cladding to be installed over the building wrap. Some materials, such as brick or stucco, absorb moisture that can be driven into the wall assembly by solar energy. Stucco, cedar, and other wood sidings may also contain surfactant chemicals (e.g. soaps, oils, and paints) that can degrade the performance of a building wrap over time, so it is important to choose a material resistant to these chemicals to ensure sustained performance. The use of air barriers in commercial construction is growing, driven by advances in building codes and increased awareness of their ability to support sustainable, comfortable buildings. However, not all air barriers are equal in performance or design, and there is not one solution suitable for all climates, regions, and project conditions. Understanding how air-barrier materials and systems are evaluated, and knowing their performance characteristics, helps design professionals find the right solution for their project needs. Approaching air barriers from a holistic view and evaluating the entire system—rather than just an individual material—results in a tighter and far more durable enclosure that can stand the test of time.